This AED contains a microphone which will record your voice during the rescue process. Just Arrived! Newest AHA G2010 Models are now shipping! Other Notes: includes five year manufacturer's warranty, soft carry case, and demonstration/setup CD. The AED that talks back...what a great idea! Why buy? CPR coaching AND feedback, single-piece electrode pad with 5-year shelf-life, uses consumer batteries, extremely water resistant. This model even includes voice recording! The ZOLL AED Plus has all the features that make it perfect for novice rescuers. The optional ECG upgrade makes it perfect for medical professionals, too. And the optional pediatric electrode pads make this a great AED for schools and places where children might congregate. 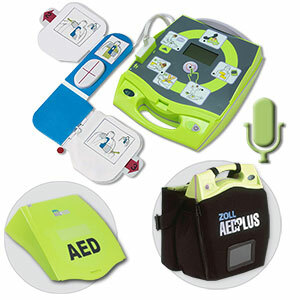 The AED Superstore has a huge selection of accessories for the ZOLL AED Plus, too. Just scroll down below to put together a package that's right for your application. Order online! It's guaranteed safe and secure. Or call one of our customer service associates now. Remember, we include free ground shipping on all AEDs delivered within the contiguous United States.